Instead of taking your eyes off the road, your phone can actually help you stay focused in your car. For all the ways smartphones have made our lives better, there’s one area where the impact hasn’t been so positive: driving. According to the CDC, more than nine people are killed and 1,153 injured every day due to distracted driving. It’s a sad but stark truth: One glance at your phone could dramatically alter your or another’s life. But your phone may actually help you prevent such a tragedy. A batch of apps have sprung forth to help you keep those eyes on the road, using a variety of strategies from reading your texts aloud to making your phone unusable. While the future is clearly with Android Auto when it comes to getting everyone to leave their Android phone alone while driving, it’s still going to be a while before such capability is in everyone’s car. Better now to get into the habit of staying focused with the tools that are available, as the risk just isn’t worth it. If you don’t have the self-control to leave you phone alone while driving, then SafeDrive might be the best option for you. Once you fire up the app, it will keep your phone in a do-not-disturb-me state that disables notifications and locks you in the app until your speed drops below 10 mph. The more time you rack up behind the wheel, the more points you earn. You redeem those points for various offers. SafeDrive dangles rewards in front of you in return for leaving your phone alone while driving. I found it worked rather well, but the key is remembering to turn on SafeDrive each time, something that can get annoying. The best method is to use the Android Wear app. Fire up SafeDrive right away with the Android Wear app. While the overall goal of SafeDrive is to keep you off your phone, there’s a button that will launch Waze if you want a fast way to get into navigation. If you’re a fan of the social driving service, this gives you a quick way to check out the traffic and then put your phone down and leave it in the distraction-free mode. When you finish up the journey you’ll see your reward totals, but the redemption options are rather limited right now. You can get discounts on random items like a car phone mount or a “smart” light socket. It’s not tremendously compelling; there definitely need to be some more goodies on offer. Instead of explicitly trying to get you off your phone, Drivemode tries to make the interface so simple and gesture-oriented that you won’t need to look at it while driving. The app throws a semi-circle shaped tab on your home screen that you can use to quickly launch into, well, a driver mode. The app smartly uses an Android Wear app for this purpose, so you don’t even have to fiddle with your phone to get started. Drivemode puts a notification on your smartwatch for rapid launch. Swipe through for actions like maps (you can select a default), music, or calling a specific contact. I liked the customization options, as I was able to set up particular contacts who can get through when the app is enabled while others can be ignored. Drivemode also reads messages and generates an auto reply, though Google’s default robo-voice still sounds like a robot that is being forced to read messages against her will. 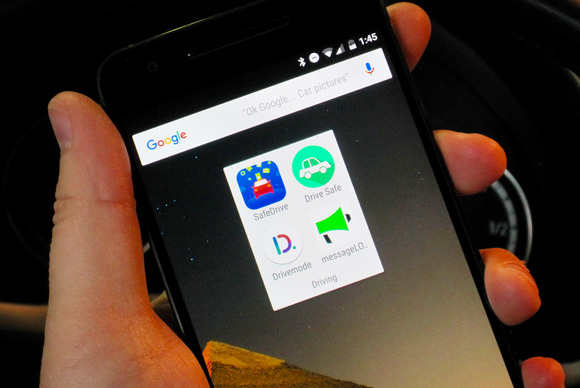 Drivemode puts a quick launch tab on your home screen, though thankfully you can resize or eliminate it. Fortunately you can resize the Drivemode Tab, as the default choice puts an annoying bulge on the left side of your screen. When you slide it to the right, you’ll launch into the safe screen. My favorite part was that Drivemode learns your destinations, so it’s much faster to launch a navigation from one of the auto-presets. Otherwise it’s easy to learn where the main features are, so you can quickly swipe to navigation, maps, or a contact without much screen time. Drive Safe is the simplest of the bunch, but if all you want is an app that puts your phone in do-not-disturb mode and sends an auto-reply to texts, it’s a good option. You can customize a message to send out to your contacts or go with the default script. Drivesafe will send an automatic reply to anyone who texts you while you’re driving. When I pressed the giant button, Drive Safe also put my Nexus 6P in the do-not-disturb mode that only lets alarms through. This functionality may differ depending on your device, but the benefit was that I didn’t get pinged when texts arrived. While this app doesn’t offer the same amount of customization as the others, that’s kind of the point. Sometimes you want a dead-simple operation, and for this purpose it does the job well. Listening to something can be distracting too, but at least with MessageLoud you won’t be tempted to take a look at your emails and texts, since the app will read them to you. MessageLoud is a good nanny. If you try to text, it will kick you out of the messaging app and send you back to the the app’s screen. No electric shock has been employed, but maybe that’s a good idea. MessageLoud will tell your contacts that you’re busy driving. There are a few customization options, which I found helpful to pick which of my contacts I wanted to let through the firewall. The app will read the ones from those you greenlight and stay mum for the others. It does an admirable job reading texts and emails, though I find it’s burdensome with the latter since the subject line and other non-narrative aspects of an email don’t translate well. But if you’re dying to hear who messaged you, this might keep the phone out of your hand. When I tried all of these services out, I couldn’t help but feel like they were all good solutions, but the real fix is with Android Auto. Even with simple gestures or text message announcements on your phone, you’re still at risk of fumbling for it and glancing away from the road. 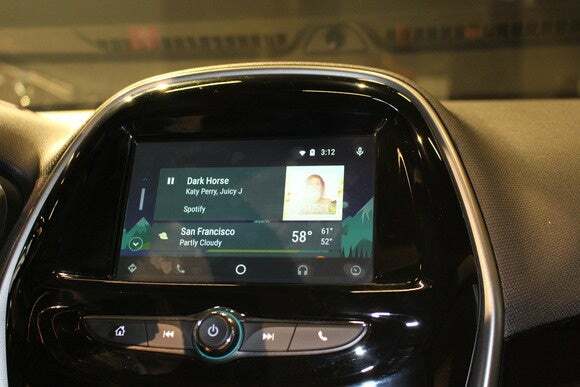 Android Auto (as seen in a 2016 Chevrolet Spark) will be available on the 7-inch infotainment systems first, and the 8-inch systems later in 2016. Android Auto largely fixes this by putting key information on your dashboard screen. Yes, you’ll still need self-control to keep your eyes on the road, but the software already does some of this by disabling certain functions. And because it’s right in front of you, there’s less potential to completely turn away from driving. This process reaffirmed for me how important this issue is: No text, email, or call I received while trying these apps out was worth the possibility of a wreck. So while these solutions may help you stay focused, the one with the real power to make that happen is you.